It is inevitable that when talking to people about evolution there will be some misunderstanding of the path that led to humans as we currently exist: Homo Sapiens. No, we did not descend from chimpanzees. We are distant relatives but we evolved from a species that split from the species that evolved into chimpanzees 6-7 million years ago. Using a 30 year generation, that was 200,000 generations ago. That is a lot of great, great, great, grandparents before you get to a shared ancestor. No, we did not descend from Neanderthals. Once again, related but not descendants of. Think of them as cousins of humans. Neanderthals came into existence ~500,000 years ago and died out about 28,000 years ago. When homo sapiens came into existence about 200,000 years ago we existed as two separate species and, in essence, Neanderthals were not “fit” enough to survive in the rough conditions of 30,000 years ago. Humans, in contrast, being a different species were fit enough and have since continued to exist and evolve. No, humans and dinosaurs did not live at the same time. The last of the known dinosaurs died off 65 million years ago. Humans as a general species came into existence somewhere around 2 million years ago. That means there was a 63 million year gap between dinosaurs and humans. We only existed together in science fiction and the Flinstones. 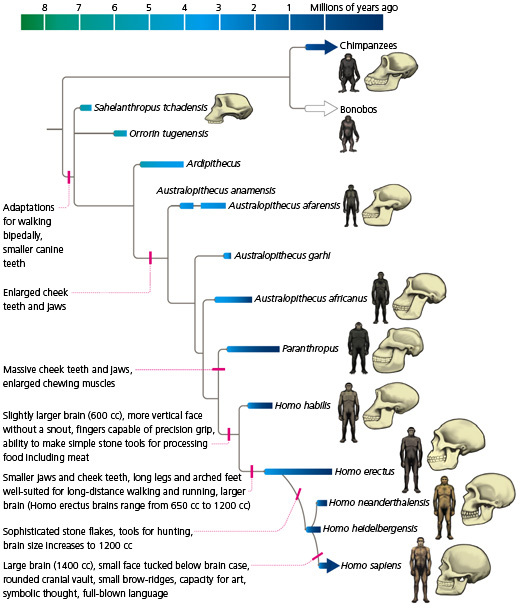 Here are a few diagrams that may help give you a visual of human evolution. A very simplified diagram of primate evolution. This diagram follows the more detailed path of human evolution. As seen above, humans have evolved from a number of ancestors and species. This also shows the cohabitation of homo sapiens and Neanderthal species. You can also see where certain human developments, such as anatomical change and tool use, have occurred in the evolution of modern homo sapiens. So there is the simple breakdown to how we became human. We are primates, yes, but we are also distinctly human and vastly different from most of our primate cousins. Thanks for reading, have a great evolved week! You’re welcome- thanks for reading!